Less than a year after college, I bought a small stake in Babcock & Brown Aircraft Management (NYSE: FLY). I knew much less about investing than I do today, but I was primarily attracted to the company’s business model, low P/E ratio, and high dividend yield. Before long the company changed its name to Fly Leasing (following the collapse of its original parent company), and the stock has produced strong returns for me ever since. Barring some unforeseen change, it’s possible I may never sell this company as it currently exists. It was my largest holding at the time of purchase; now it is by far the smallest in my portfolio. 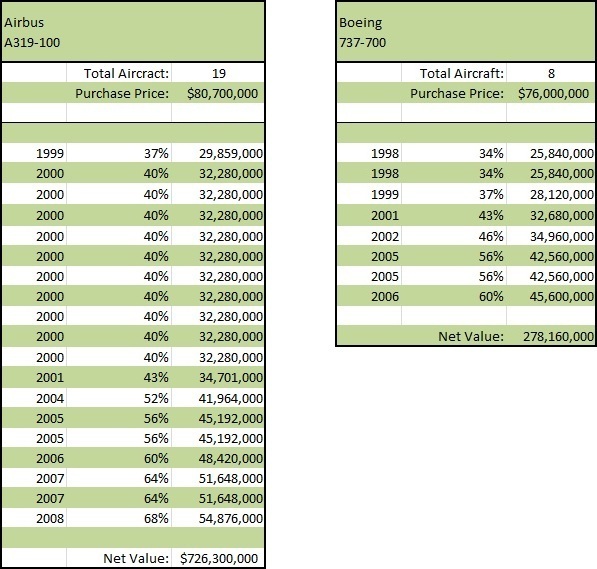 Recently, I put together an updated estimate for an asset-based valuation of Fly Leasing. Even though changes in the company’s stock price now have little impact on my overall portfolio, I still want to have some quantitative idea of what the company is worth! Using such calculation across all the aircraft types, I calculated that the total value of the aircraft was $5,617,566,000. This is a very optimistic estimate, considering that the most recent balance sheet has Flight Equipment valued at $2,868,678,000, which is just 51% of the value I calculated. So, how does this translate into a per share valuation of the company? Flight equipment held for operating leases are recorded at cost and depreciated to estimated residual values on a straight-line basis over their estimated remaining useful lives. Useful life is generally 25 years from the date of manufacture. Residual values are generally estimated to be 15% of original manufacturer’s estimated realized price for the flight equipment when new. These depreciation methods are typical for this niche industry, with other major players having identical/similar methodology. Still, my calculations give an upper limit of what the company’s flight equipment may be worth in the open market. 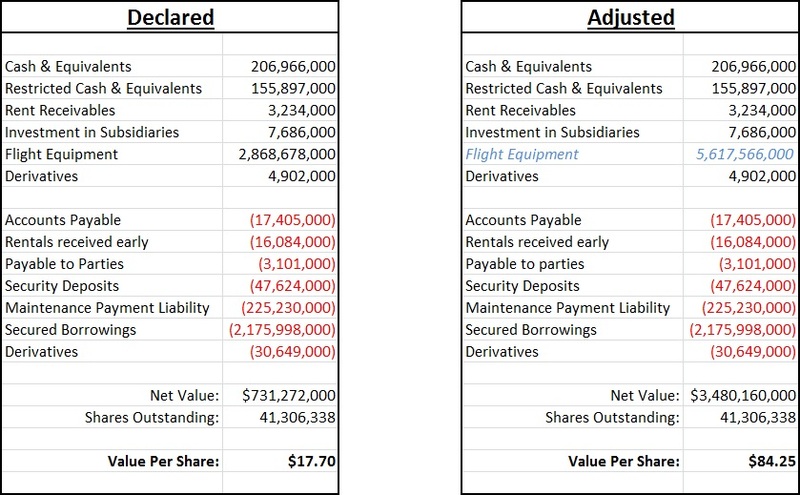 Using the values from Fly Leasing’s balance sheet, we can see that the company is worth $17.70 per share, which is a 15% premium to the current share price. To be clear, I don’t view the company as being worth the $84.25 per share I calculated. I merely think that these calculations indicate that company is worth more than the $17.70 per share its balance sheet indicates, however, and certainly more than the $15.34 it is selling at! These calculations indicate that the depreciation methodology used by the industry is quite conservative; by loosening those standards just a bit, the value of the aircraft (and therefore, the company) drastically increases. In addition to the asset-based valuation, it’s important to remember two things: first, there’s a 6.5% dividend yield that the company is dedicated to paying (it increased by 13% last year). Unlike many asset-based companies, Fly Leasing also has strong earnings (especially relative to its price). The P/E ratio sits at 6.07 – a level much lower than its rivals. Sure, I have concerns about the company; there are valid reasons why I’ve never upped my stake in the company. My primary worries are the rising debt, the recent dilution, and the age of the fleet. The company has taken steps to address the latter, as the average age of the fleet has decreased in the past year (through the sales of older aircraft and the purchases of newer ones). Analysts frequently complain that Fly Leasing’s fleet is older than its rivals, but I’d counter that this has yet to manifest meaningfully in a negative way on the company’s earnings, or with the demand for the company’s aircraft. The other two concerns are of greater magnitude. Through the years, management has frequently stated that they are always on the lookout for deals, provided that the aircraft market is conducive to such purchases. 2013, it appears, met management’s standards. In order to fund the aggressive acquisition program, however, management relied on debt issues and an offering of common shares. The company has traditionally been quite leveraged; the funding of new aircraft with borrowed money wasn’t too upsetting as it has been the modus operandi of the past. The company’s basic business model has been to borrow money, buy aircraft, secure the loan with the aircraft, and then have airlines around the world sign long-term leases on those planes. This has been successful, so I couldn’t get too upset by them issuing $300 million in senior notes a few months back. The announcement to issue 11.4 million new shares, however, sent me up a wall. The company only had 28 million shares before this transaction, so it represented a major dilution of the existing shares. Furthermore, I viewed it as sneaky; the dilution was announced on July 9, priced on July 11, and finalized within a week. On the one hand, I understand that management saw the market as ripe for acquisitions and needed to raise cash to fund their moves. On the other hand, I was thoroughly pissed off (as any shareholder would be) that they went about it in such a manner. Should this happen again in a similar or larger fashion, I will consider selling off my shares. Barring such a move, however, I’m confident in the company’s ability to continue growing, paying its dividend, and generate earnings. Despite its dilution last year, I maintain confidence in management’s ability to successfully buy, lease, and sell aircraft at a profit. More importantly, I see the company as undervalued relative to both its earnings and its assets, and therefore will continue to hold shares for the foreseeable future. This entry was posted in General, Stocks. Bookmark the permalink.